Dedicated to the best-selling Victorian and Edwardian novelist, her life and times in Stratford-upon-Avon. Items and artefacts that belonged to or were associated with Marie Corelli, including her Venetian gondola ‘The Dream’. Built: Venice 1904 by Giuseppe Casal. Type: Gondola di lusso with carved and gilded decorations on the decks and armrests. Originally with canopy. In use: by Marie Corelli from 1904 to circa 1916 on the river Avon, and laid-up until 1943 and the dispersal of the estate. Currently: Restored and for hire from Avon Boating at Stratford-upon-Avon. In the early 1900’s hordes of visiors came to Stratford-upon Avon to see the home of it’s most famous literary figure, but they were not going Shakespeare’s birthplace, they were going to Mason’s Croft, the home of the international best-selling novelist Marie Corelli. They had read most of the romantic and mystical novels that had given Marie Corelli her widespread fame and success, and now hoped to catch a glimpse the author in person. Marie Corelli had moved to Stratford-upon-Avon from London in 1899 ostensibly for the comparative peace of life in this small market town well known for it’s literary associations. She was a clever self publicist, courting attention while pretending to avoid it in a quiet backwater. She cultivated a mystery about her exact origins and took every opportunity to expand on the exotic image the press and public built up around her. In 1905 a gondola arrived in Stratford, and was launched on the 10th May, to be reported in the following weeks local newspaper. "The attractions on our river have been added to by the launching of a fully equipped gondola by Miss Marie Corelli. This Lady never does thing by halves. In their plainness gondolas are not conspicuous objects. But with appropriate drapery and hangings they can be made to look very pretty and comfortable. In this instance the adornment is reported to be in exquisite taste. And that everything may be in character an Italian has been engaged as gondolier, and very picturesque he looks in his bright-coloured habiliments. One could fancy him as being imported direct from the lagoons of Venice. Our punts will now have to hide their diminished heads." 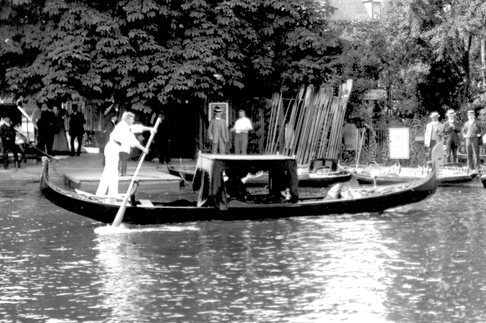 The gondola on the Avon circa 1910, with Ernest Chandler as gondolier - image courtesy The Shakespeare Birthplace Trust. Letter from marie Corelli to A.H. Bullen, 16 May 1905. The gondola had not come directly from Venice, though was undoubtedly the impression that Marie Corelli intended to give, but was bought by her at an auction held after an Italian Fair in London at White City in 1904. The gondola had been ordered earlier that year by London Exhibitions Ltd from Giuseppe Casal, a well known gondola builders in Venice. What makes this gondola unusual and unique is that, at only 24ft long, it is two thirds the size of a normal sized gondola found in Venice. It was built slightly smaller undoubtedly for ease of transportation to England, and most likely to make it easier to handle on a small man-made pool at the Italian Fair. The origins of the gondolier she found, named Giovanni, are less clear, but it is probable that he had come from Venice to row the gondola at the Fair, and that Marie Corelli engaged him when she bought the gondola. The gondola’s arrival at Stratford not only helped to support Marie Corelli’s self-styled image as an an Italian Contessa, but immediately gave her the most unusual and exotic craft on the river. However it’s operation to begin with did not go entirely smoothly. The gondolier, Giovanni, was soon anxious to return to Venice, but with little to do he fell in with some of the members of the Stratford-upon-Avon Rowing Club who drank at the Black Swan or Dirty Duck pub by the river. During a particularly raucous evening in the bar that summer, he got into an argument with one of the locals and, displaying his Mediterranean temperament, threatened him with a knife. Although he was backed up by his Rowing Club drinking partners, who said that it was their fault for getting him drunk, and that no actual harm had been done, Marie Corelli dismissed him at once. It is clear that Marie Corelli loved boating, and her new gondola which she named ‘The Dream’. It was Marie’s habit to go out on the river after dinner with her constant companion Bertha Vyver. The gondola was looked after by Davis’s, the old boat hirers by the ferry, and Ernest would have the gondola waiting at the ferry steps to pick them up to take the cool evening air, sometimes staying out until after dusk or even until midnight. Apparently, Marie would often write during these nocturnal outings, sketching out ideas for her next book,. The highlight of the summer on the river was the June Regatta at the Rowing Club. Marie Corelli had been president in 1901 when she had given the club the Kings Trophy Cup in honour of Edward VII’s accession. A report in the local paper on the 1905 Regatta describes how Marie Corelli took up position near the winning post in front of the crowds assembled on the banks of the river to watch the racing. In the evening, the fun and celebrations continued with an open air concert on the riverside. Boats on the river would be decorated, and lit with small lights; their occupants dressed in costume, vying with each other to be the most elegant vessel on the river. When not being used, the gondola was kept on moorings opposite Holy Trinity church, though it has been said that for some of it’s time, it occupied the subterranean boathouse accessed through the central wet arch of the Vicars arches, a feature that may be seen in old engravings, and very old photographs of the river. The arches belonged to Avonside, the old vicarage just upstream of the church. The house was demolished in the 1950’s, and though the riverside feature of the arches survived, they were blocked and buried as a potential hazard, and finally destroyed in the rebuilding programme for the theatre that is due for completion in late 2010. Marie used the gondola for many years, and it appears regularly in old photo’s of the river at Stratford. In 1916, Ernest was called up for service in the First World War and sadly killed in May of 1917. Marie Corelli never used the gondola again, though it has been said that no-one could be found who could master the subtleties of rowing ‘alla veneziane’, or in the Venetian fashion, as Ernest had done. After a few months rocking on it’s moorings, the gondola was taken off the river and put into the yard of Ho;y Trinity College, then moved to Mason’s Croft, Marie Corelli’s home, and stored in the garage. After the war, Marie Corelli’s popularity as a novelist began to wane, and though the gondola was kept polished and preserved, the frivolity and intrigue of those early days in Stratford, and her beloved gondolier, had gone. In May of 1924, just before her 70th birthday, Marie Corelli died. Her will left Bertha Vyver in Masons Croft looking after the house and her possessions, none of which were touched. The gondola remained in the garage at the house for 27 years up until 1943, when, following Bertha Vyvers death, the estate was finally dispersed. Marie Corelli’s effects were all sold at an auction at Mason’s Croft, and although some local lads clubbed together to try and buy the gondola with £10, it was bought by a Mr R.O.Gray for 67 Guineas. Mr Gray came from London, but had a wartime machine shop on the site of the old cattle market, and had been a fan of Marie Corelli. He intended putting the gondola back on the river, and it was repaired and renovated by George Onions, a local boatbuilder at Collins boatyard, but the gondola was moved down to his factory in Hendon for storage where it then lay unused. The gondola was tracked down again in 1958 by Mr Mervin Griffiths, who persuaded Gray to part with it for £200. It was taken to Cambridge where, after a few repairs and a new coat of paint, it appeared in May week in 1959. He then bought the gondola back to Stratford where it was seen on the river Avon briefly for the first time in 43 years. Mr Griffith's tried to find a mooring for the gondola from which to ply for hire, taking tourists up and down the river. Unfortunately the established boating fraternity were none too keen on this exotic intrusion, and so he moved the gondola to the lake at Ragley Hall, hiring himself and the gondola out to visitors. The gondola remained on the lake at Ragley, bobbing at her mooring, until one night local lads playing around sank it in deep water. In 1962, Turks of Kingston-upon-Thames, were looking for a gondola for film work, and after hearing of Marie Corelli’s old boat, they bought the gondola from Mervyn and salvaged it from the lake. Turks kept the gondola for nearly 50 years as part of their collection of small craft kept at Sunbury for film, TV and promotional work. The gondola was by now over 100 years old and showing her age, and in 2007 Turks decided to give her a complete rebuild. They stripped off a layer of fibreglass sheathing put on many years before to help stop her leaking, replaced all of the frames and renewed the hull bottom and sides, restoring her strength and integrity. Fortunately, during this comprehensive work, the boatbuilders managed to retain most of the gondola’s original features that give her her unique style and character. Work stopped on the gondola before she had been finished, and the boat collection was moved from Sunbury to a new storage site in one of the old boat sheds at Chatham Historic Dockyard. Unfortunately Turks were finding it hard to make the collection pay for itself, and in 2010, decided to sell all of the boats at auction. Nick Birch at Avon Boating in Stratford-upon-Avon heard of the auction and managed to buy the gondola against some determined opposition. 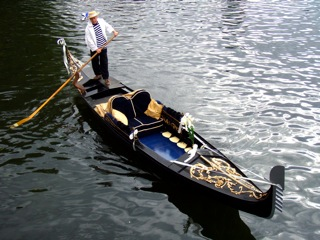 Avon Boating had a full size gondola that Nick bought back from Venice in 1995, inspired by Marie Corelli, but he was determined to obtain the original and to see it finally returned to the River. The gondola was transported to Avon Boating’s workshops at Stratford where restoration was completed, including a new coat of black paint, re-upholstering, and re-guilding of the carvings . She was re-launched at the Stratford River Festival in July of 2010, and is now available again for outings on the river.